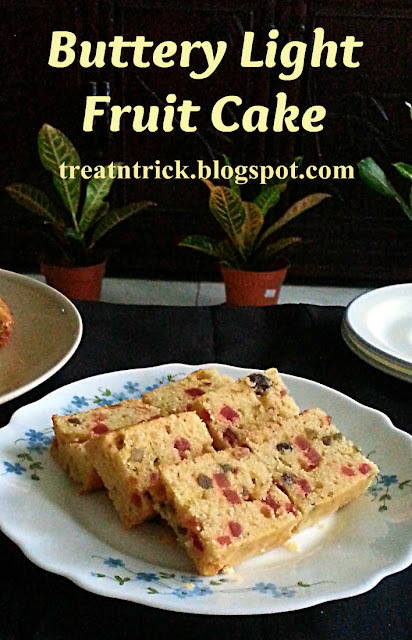 No festive season is complete without fruit cake. There were so many different ways to make one. 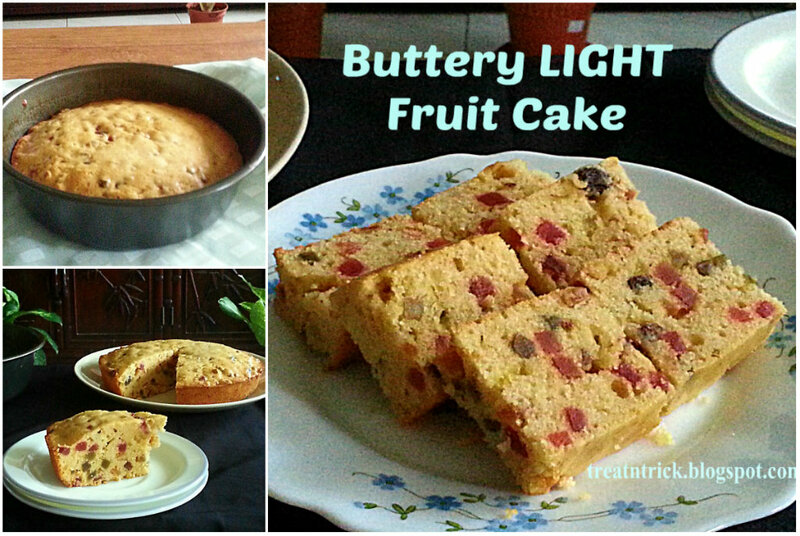 But I always prefer the one with less fruit like this Light Fruit Cake. This Buttery Light Fruit Cake will cut down the time you soak the dry fruit. Soak the fruit in orange juice, microwave for a minute to plump them then leave to cool. If you mix your own dry fruits, you need to add candied red and green cherries to the batter. It would look prettier with those. I used store bought mixed fruit that include both cherries. The sweetness was just right, adding more sugar isn't necessary. We get natural sugar from the dry fruits. 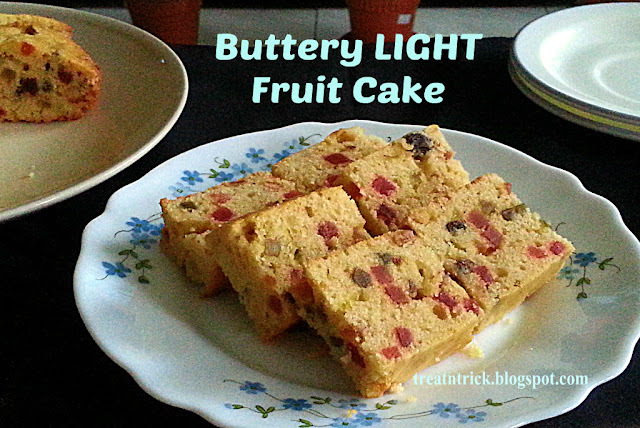 This Buttery Light Fruit Cake is so simple to make yet tastes awesome. I used this recipe successfully to get a quick festive treat. If desired, decorate with additional candied fruits and nuts. Soak dry fruit mix in orange juice. Microwave for 1 minute. Leave to cool. Sift flour and baking powder. Preheat oven @ 170 C and grease 9 in round cake pan. Beat butter and sugar until light and creamy. Add in salt. Mix in flour little by little, stir until well mixed. Add in fruit mix together with orange juice, stir. Spoon mixture into cake pan, level top with spatula. . Sit in pan for 20 minutes before transferring onto rack to cool. I just love fruit cakes! My mom loves fruitcake, what a delicious surprise this would be. Thanks for sharing with Small Victories Sunday Linkup. Pinned to our linkup board. Well this sounds tasty! YUM! This cake looks great and thanks for sharing the recipe at Cooking and Crafting with J & J. Sounds delicious, thank you for sharing at The Really Crafty Link Party this week! Pinned! This is how we make our Christmas cake and its yum!! Whoa!...this looks so yumm - light and nice . Would be a great accompaniment with tea. This is delicious.. did i tell you that i tried the banana cake recipe you had shared this weekend.. and it was yummy!! Keep writing.. It looks so delicious! I love the ingredient combinations! This looks delicious. I've never made fruit cake, but my Grandma always did. Thanks for sharing at Merry Monday.